The TeleBlend reseller program makes it easy for you to resell TeleBlend service regardless of your organization’s size or resources. With no sales quotas to meet, little to no start-up costs and full product and sales support, you can be ready to sell TeleBlend service quickly and easily. Your only responsibility as a reseller is customer acquisition. TeleBlend will take care of all customer support and hardware fulfilllment so you can focus on making this partnership as profitable as possible for yourself or your business. Click Here to View a Sample Picture of a Reseller Site! 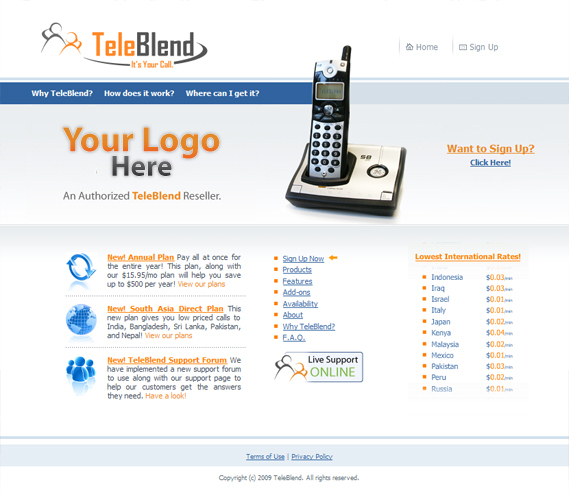 What are the Benefits of Reselling TeleBlend Service? Why are people buying TeleBlend? Step 2 Speak with a TeleBlend reseller program manager for prequalification. Step 3 Fill out and sign a TeleBlend reseller agreement, W9 and vendor form. Step 4 Start selling TeleBlend phone service!